War brought them together and separated them. Love overcame both war and time and brought them back together. Hospital in Saigon when the call came for a medic to fly with a dust off crew to the site of a downed helicopter. All of the medics were on other assignments. Kathleen hesitated a moment and responded, "Send the dust off, a medic will be on the pad." Though it was against regulations for a woman to go into a combat situation, Kathleen was waiting at the landing pad when the chopper sat down. The pilot tried to talk her out of going. Kathleen said, "It's me or nobody. We're wasting time here." The wreckage of the downed Huey was scattered over a large area and the landing zone was still a target for VC snipers. Kathleen and the dust off crew loaded the two survivors they found and were preparing to leave when one of the wounded men grabbed her arm and shouted, "Did you get Maddog." Straining to be heard above the sound of the screaming turbine, Kathleen shouted, "Who is Maddog?" Kathleen stood, leaned across the back of the dust off aircraft commander's seat and shouted into his helmet, "Hold here. We've got to find Maddog." Before he could reply she jumped from the chopper. Kathleen spotted Maddog fifty feet from the the main fuselage and with one of the dust off crew men, carried him back to the chopper. As they lifted out of the landing zone Kathleen touched the door gunners arm. When he opened his eyes, she shouted. "We've got Maddog." ˃˃˃ Maddog left Vietnam on the hospital flight that took Kathleen back to the states. "I don't read war stories. Ever. This is not a war story. This is a life story. There are bits of romance, bits of joy, bits of pain, and a lot of reality. As always, Bert Carson grabs you by the heart and gently carries you through a world that you never thought you could love. Honestly, I never would have read this book if I hadn't met the author. It is far from my usual world of light-hearted fiction and mystery. I would have really missed out. Bert's ability to mix reality and fiction makes history come alive and often leaves you wondering how much of the story is truly fiction. Read it, you won't regret it." 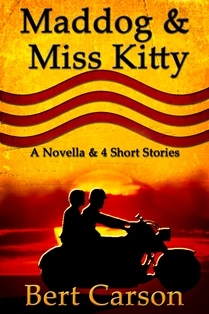 ˃˃˃ Maddog and Miss Kitty is a Novella with four short stories. "The four short stories following the novella are not to be overlooked. They are touched with divine hope. "Tennessee Waltz" is a reminder of how much veterans see beyond the names on "The Wall" in Washington D.C. There are unexpected angels in the midst of horror. The "Medic" finds unexpected duty is tinged by a hint of the miraculous. "Lady" helps a veteran find freedom again. "Snow" is heartwarming and magical. This is a book worthy of five stars. It shines for all Vietnam Veterans."